I don’t intend to record thoughts on every single day of the vendanges but there are some days which deserve a special mention. Yesterday, August 30th, was one of those days. And the reason was simply the quality of the grapes. These are my fourth vendanges and I do not recall such a consistently high standard of fruit coming from one parcel from the first case to the last. The grapes were Syrah and they came from La Garrigue vineyard. La Garrigue is interesting because it has a ridge running through the middle, west to east. The slope facing south is planted with Grenache as it is a cépage which loves the sun and heat. The slope facing north is planted with Syrah, which certainly likes sun and heat, for example in the Rhone Valley, but not so much as Grenache. The Syrah of La Garrigue produces, in very good years, my favourite wine of all from Jeff Coutelou (and therefore, in effect, my favourite wine). That wine is La Vigne Haute which combines the warmth and fruit of the Languedoc with the serious, mineral complexity of the Rhone. Sadly there has been no Vigne Haute produced since 2013 as Jeff has felt that the quality was not quite high enough for such a cuvée. In the excellent vintage of 2015 the decision was marginal and instead he produced the excellent On Peut Pas Vraiment Dire Que, which you can read about here. Perhaps its my bad influence since the 2014 vendanges but La Vigne Haute eludes me. This year when I took the photos of the Syrah in La Garrigue (above), Jeff was concerned that the very dry months of summer had spoiled the Syrah but recent humid days had allowed the vines to recover and put their energy into the grapes.Well, I really have my fingers crossed for 2017. The grapes came in firm bunches, healthy to the core. 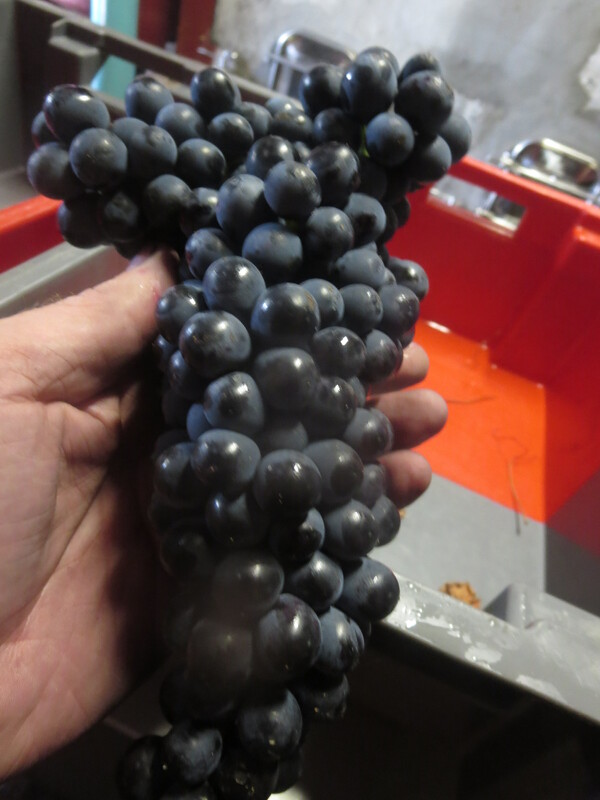 Classic Syrah bunches too, almost T shaped. The cases smelled of spice and fruit, other than snails with good taste there was little to sort. The juice gave aromas of passion fruit – not something I would ever have imagined possible but tropical fruits for sure. Flavours of raspberry, wild strawberry with a lovely vivacity. This was exceptional. Now, a lot can happen in the next few days, weeks and months. Jeff will simply allow the juice to express itself and not intervene, Coutelou wines are what nature makes with a simple guiding hand. 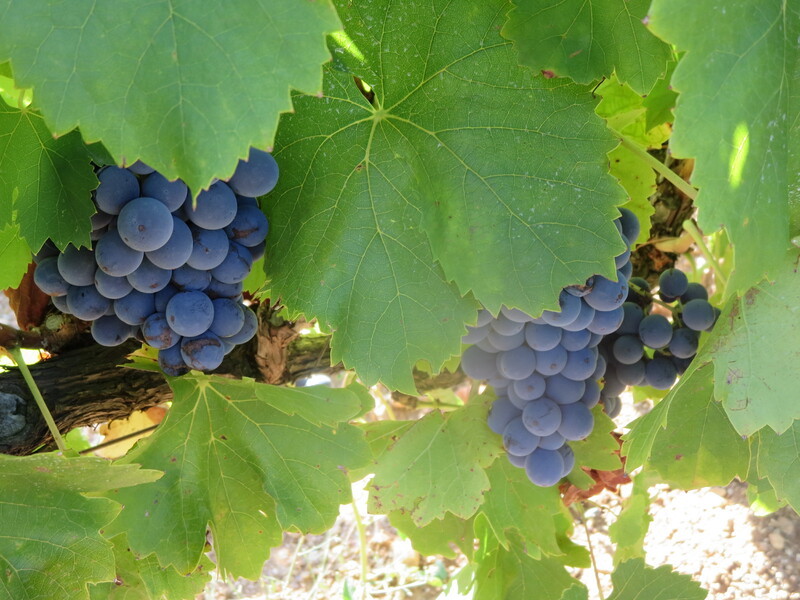 There are many more days of the vendanges to come, and there are some exciting grapes on the vines still. However, these grapes motivated me to write, to cross my fingers and trust in nature and Jeff to, maybe, finally deliver my favourite wine. Whatever, it will be worth buying and drinking, I can hardly wait. Categories: Vignerons, Vines, Wines | Tags: La Garrigue, La Vigne Haute, Mas Coutelou, On Peut Pas Vraiment Dire Que, Syrah | Permalink. After the white grapes picked last week it was time to tackle the red, which form the main part (just under 90%) of Mas Coutelou’s production. Monday was hot, very hot – Jeff’s car measured 42°C at one point in the vineyard of Le Colombié where we were picking Merlot grapes. This small (0.5 ha) parcel was planted with Merlot back in 1999 and, though not Jeff’s favourite cépage, the grapes provide a useful backup and the vines are in particularly good health. I spent a couple of hours picking and the heat made it very hard work, believe me. 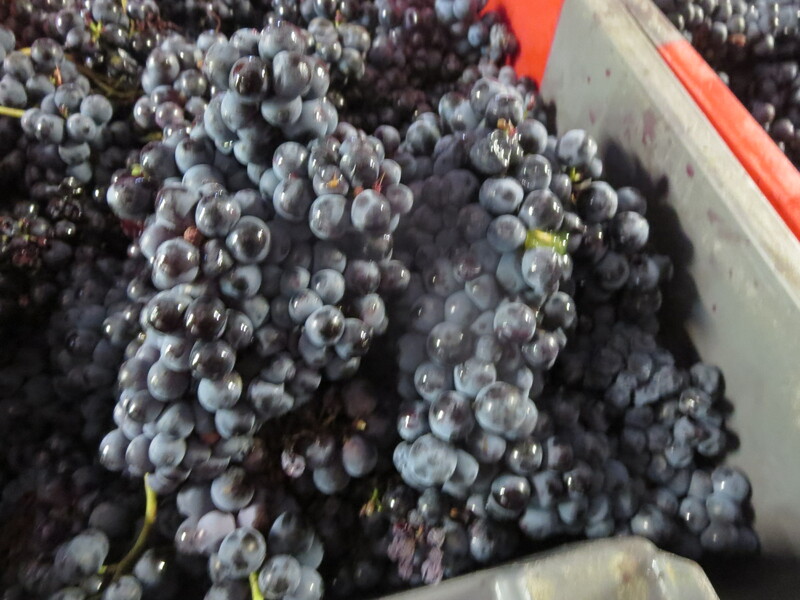 The quality was very good though the grapes lacked juice due to the lack of any rain in two months. Jeff said that they provided around 50% of last year’s juice which in turn was 20% below average. Back in the cellar after lunch I sorted the remaining Merlot and some Syrah from Segrairals, the biggest of the Coutelou vineyards with 4ha under vine. 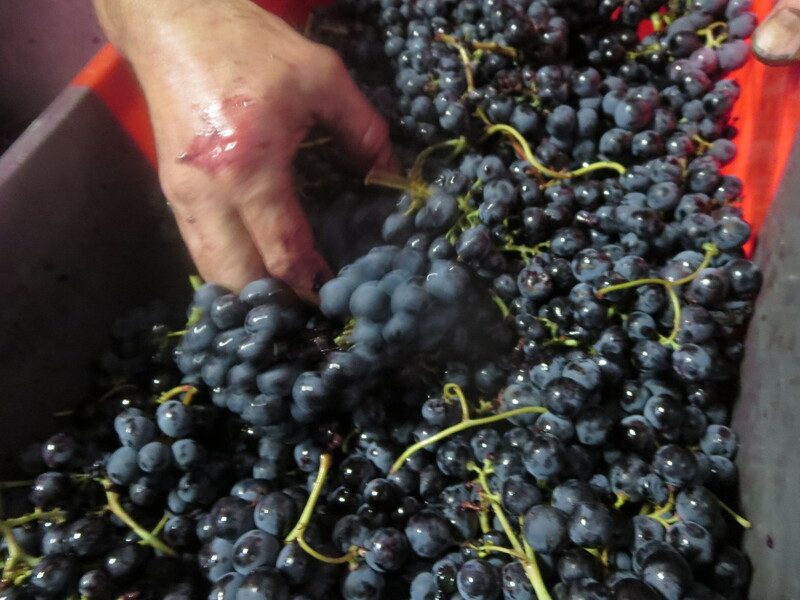 These were juicier and were added to the Merlot in tank in order to bolster the quantity. The alcohol level was good at around 14% for both. 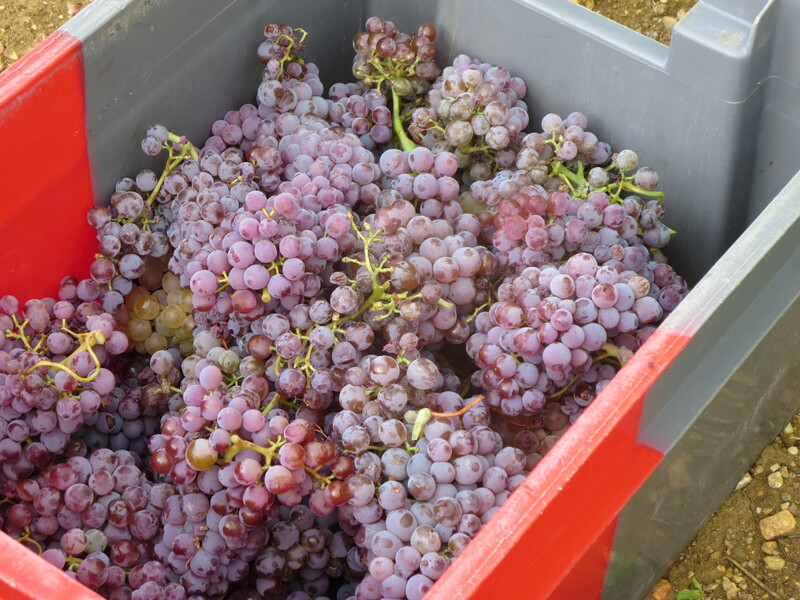 Today, Tuesday, it was off to Sainte Suzanne where Jeff thinks some of the best grapes of the year are to be found. The vineyard is planted with Syrah and Grenache and these are usually the grapes which make up Le Vin Des Amis, one of the more famous wines of the domaine. Jeff was proved correct, not that I would have doubted him of course! The bunches which came in were full, firm and in excellent condition. There was hardly any sorting to do other than removing leaves and snails. This will certainly make good wine. By the end of the day a few rows of Grenache from the parcel were added to the mix. The grapes were all put into tank in whole bunches, grappes entières, rather than being separated from the stalks as the bunches were so healthy Jeff wanted to let them express themselves. In tank the grapes will begin to ferment within their skins under the weight and heat, though some will ferment as they burst. It was good to see Jeff happy with the results of the day’s harvest, long may it continue. In the photos above Vincent is preparing the cuve for the whole bunches which will enter through the trapdoor at the top. In the second he adds CO2 to the tank which is part of the carbonic maceration process to help the berries ferment inside their skin. Categories: Vignerons, Vines, Wines | Tags: carbonic maceration, Grenache, Mas Coutelou, Merlot, Syrah, vendange, Whole bunch | Permalink. Storing wines is fraught with risk; temperature, light, vibration and humidity (or lack of it) can all spoil bottles so care must be taken. Some wines benefit from keeping, others are designed to be drunk fairly early. How long to keep them so that they are at their best? Some people prefer younger wines when fruit is more upfront, others prefer more flavours from age; leathery, earthy, more complex perhaps. If possible it can be interesting to have a few bottles of the same wine and drink some early, some over time. I have done this with 1990 Bordeaux wines and still have a couple of bottles of cases I bought all those years ago. It has been interesting to watch their development from tough and tannic, through balanced and fruitful with classic cigar box notes to the dry, mushroom and port like flavours when tasted this year. The colour too changed from purple/red to claret and ruby to orange brown. The last bottles need drinking now, they are less pleasurable perhaps than even 2-3 years ago though they are still enjoyable and pleasing in a more academic manner. However, buying a case is not always possible or desirable. Some wines are intended to be aged for a few years, certainly the more expensive bottles from classic regions of Bordeaux, Burgundy and the Rhone. Sweet wines too age well and develop richer flavours (I generalise of course). 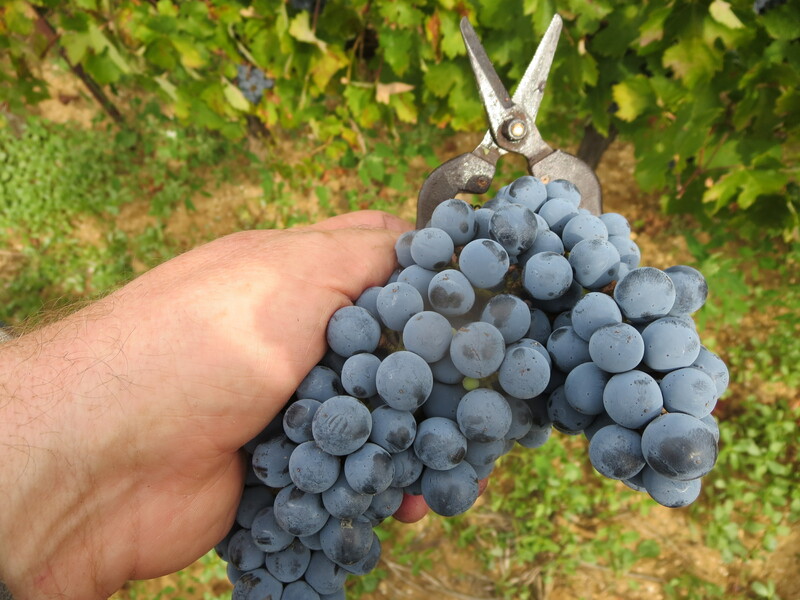 Wines from grapes such as Mourvèdre, Syrah, Grenache, Carignan can age very well because of the levels of tannin in the wine, Italian grapes such as Nebbiolo likewise. Back labels might offer advice about how long to keep the wines, otherwise search vintage charts or the producer’s website. Some like Domaine Treloar offer clear advice on each vintage of each wine. I bring this all up because this week I opened two bottles of Languedoc wines from 2007. Both were excellent and were perfect examples of the advantages of ageing wines. Domaine D’Aupilhac in Montpeyroux is one of the most famous of Languedoc wine producers. Sylvain Fadat has long produced a range of very good wines. Les Cocalières 2007, a blend of Syrah, Mourvèdre and Grenache it was still fruity but had aromas of herbs and the age had developed leathery, earthy notes. Very good, the flavours lingered long. Even better, one of the best wines I have tasted this year was Domaine La Marfée’s Les Vignes Qu’On Abat 2007. Pure Carignan made by this domaine on the outskirts of Montpellier by Thierry Hasard. If you need proof of how good Carignan can be (other than Flambadou) then make a beeline for this wine. Brambly, liquorice flavours with almost citrus freshness, the wine improved over the course of several hours, developing yet more flavours and aromas. This would have kept for many more years, the colour was still bright ruby and there was no sign of tiredness. Truly excellent. I am sure these wines would have been excellent a few years ago, though would have needed to be opened for a while to allow their flavours to open up, perhaps by decanting which can be an alternative to keeping bottles for a long time and is something I do with many, even most, wines. Categories: Tasting, Wines | Tags: Ageing wine, Aupilhac, Cocalieres, La Marfée, Les vignes qu'on abat, Maturing wine, Treloar | Permalink. Orange wine is very, very fashionable. Often associated with the natural wine movement that is not strictly true as many conventional winemakers are experimenting with orange wines too. Perhaps the fact that they have both emerged into the spotlight in recent years has brought the two such an association. I must say I like the idea but I have not always been convinced by the wines themselves, so here are some recent experiences. First of all we should clarify what orange wine means. They are made from white wine grapes which are left on the skins for an extended period in order to extract more flavour. This long maceration also adds tannin and colour to the wine just as happens with red grapes when making red wine. The length of time for skin contact and the type of grapes will add more or less colour, flavour and texture to the wine. This was how wines were made many years ago, the current trend is a revival of ancient practices. Some countries such as Georgia have always made wines like this. I have had the opportunity to taste such wines from all over the world including Georgia. Mostly I find them pleasing the mind and appreciating the technique rather than pleasing my palate. Academic rather than pleasurable. 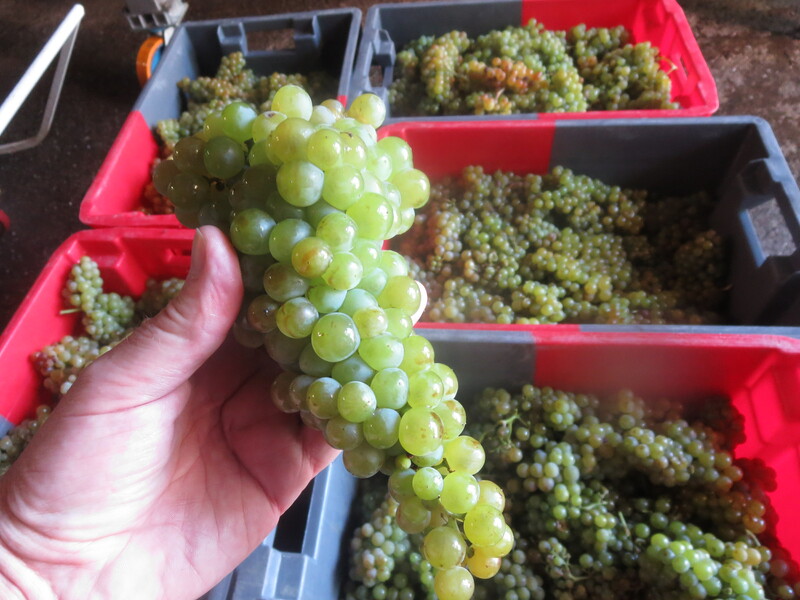 Often they lack charm, taste very dry and with no fruit, perhaps the result of overlong maceration. However I have recently tasted some very attractive orange wines. Les Choix 2014 came from Turner Pageot in Gabian, a very well judged wine as there was still plenty of apricot fruit as well as being dry and textured, made from Marsanne grapes. Very good. Ora(n)ge Sur Les Canilles 2016 is made by Domaine Ribiera in Aspiran. Régis and Christine Pichon make this delicious wine from Clairette and Terret grapes, again they have extracted good texture and dry flavours as well as white fruit flavours. Both wines have the slightest note of Fino sherry which really appealed to me. 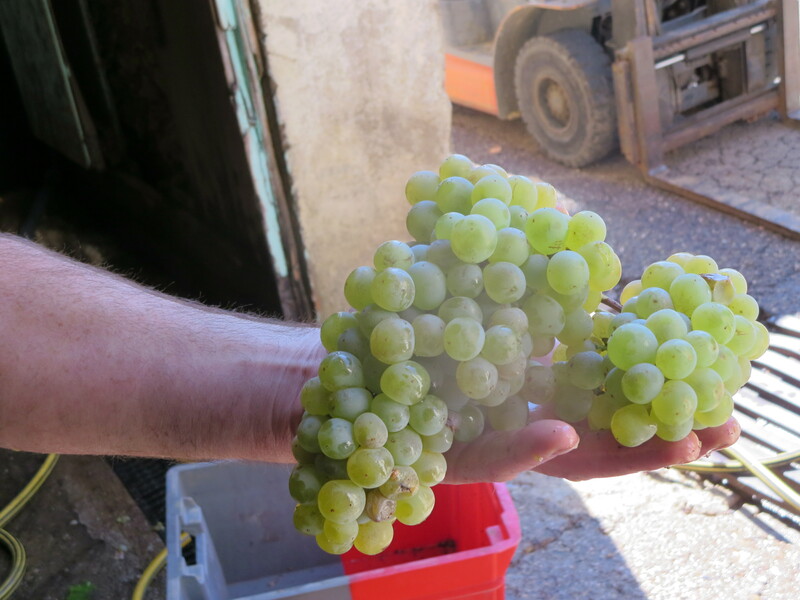 At Mas Coutelou in 2015 and 2016 Jeff used white grapes such as Muscat Petits Grains to make orange wines, usually supervised by our two Australian assistants Cameron in 2015 and James in 2016. The result in 2015 went to make OW1, a blend of eight grape varieties macerated for a couple of weeks. It is a bright colour, has good texture and plenty of fruit along with a herbal note. The following year James made the Muscat based wine and this is a real success, the muscat notes are there but restrained to give white fruit flavours which linger with good spicy notes and a dry finish. Orange, skin contact, long maceration. Whatever name you give this style these are wines requiring judgement and skill from the winemaker. I encourage you to try them but select ones from winemakers you trust. For more information from someone who knows orange wines much beter than me I would recommend this website from Simon J Woolf. Categories: Vignerons, Wines | Tags: Domaine Ribiera, L'ora(n)ge sur les canilles, Les Choix, maceration, Mas Coutelou, Muscat Petits Grains, orange wine, OW1, skin contact, Turner Pageot | Permalink.